Horses are light on their feet … light beings … graceful creatures. Anyone who has ever ridden or owned a horse will know that horses are amazing teachers. They reveal to us our habits, fears and imbalances and show us how they can read our minds and feel our thinking. They are trusting, forgiving and understanding and teach us to experience the world lightly and feel deeply. 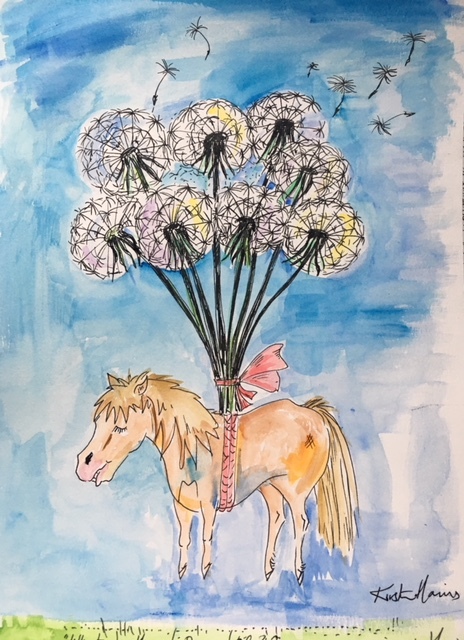 This drawing is a visual reminder to riders to take the time to think as lightly as a dandelion clock when you are with your horse, letting your thoughts float forward and up on the breeze so your body can follow. In turn your horses will follow and he will give you his lightness. He will show you how to float. He will give you his back and his mind. It will take you practise and awareness to keep letting your thoughts float in the breeze and is a totally worthwhile ongoing lesson in thinking that will develop you connection with your horse. Of course it is not the whole picture but it is a major key to the whole picture. Not because I am the worlds greatest rider, but because I understand Alexander’s discoveries and have applied and taught the work to my riding and teaching others on their horses for a long time. So why the title the unbearable lightness of being a horse? I can’t help but feel it must be somewhat unbearable for sensitive horses who can feel a fly on their flanks to have us ride them when our energy is heavy, our thinking mundane and our bodies pulled down. It is testament to how wonderful they are that they put up with it! When you understand how your anatomy and thinking work together on and with your horse, change occurs, instantly and easily. It is not rocket science! Or maybe it is?! Your horse is showing you every day what you are doing, and how you are. Being interested in how you are getting in the way of your horses lightness, is perhaps being the rocket scientist or an alchemist, certainly an experimenter … entering the world of the mystery being. Learning about the Alexander Technique discoveries is not so much about getting it right, but more getting interested and aware in how we are doing altogether. This opens our minds, changes our thinking and lets something else happens … something mysterious and light. We can’t change and stay the same, we have to enter the mysterious and the unknown to experience something different, which includes developing our connection with our horses. Alexander Technique is a great thing to learn to illuminate the way. Riders are great people to learn Alexander’s discoveries as they are so linked to horsemanship and riders are, on the whole, motivated in wanting to make life as good as possible for their horses, as custodians of these mystery beings! 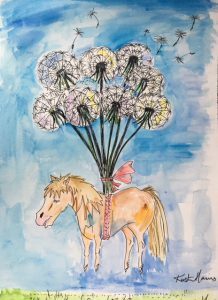 For more horsy cartoons (commissions undertaken for birthday pressies etc) here is a link to my website www.kirstenharrisart.com. Lessons and workshops by arrangement. I am based in central Scotland. And if you like my Alexander Technique inspired drawings check out my colouring book. I had a lot of fun making it.